High temperatures yesterday (13degC/55degF) allowed my girls to get out. Even finding some pollen. Good to see them. I'd missed them. 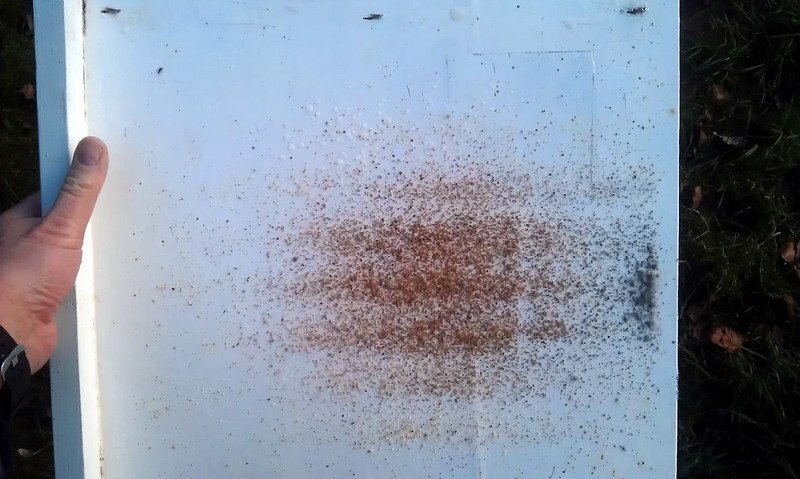 I opened the mesh floor slide for the first time in over 3 weeks and found cappings and mites . . and condensation. There is a line of water droplets (yes, I tasted it) underneath the next frame above the obvious brood patch or cluster in this photo. Damp is supposed to be bad for the over-wintering colony. What do other folk do to provide ventilation? I've seen American beekeepers who have a small entrance under the crownboard facing forwards. I could drill a hole? Do nothing? These girls are in a National brood box under a crownboard with the hole sealed up by a takeaway container of baker's fondant, which they were taking, and a sheet of silvered bubble-wrap insulation. The entrance is still restricted to a couple of holes in the mouseguard. Hi, in my nationals, Warre and HTBHs I have open mesh floors in all of them. However given the wide range of places I have seen bees set up on their own - trees with a single entrance hole, Plastic Dalek type compost bins which my instinct said would end up with melted comb and many others my view is that it is something we worry about too much. The only time I have had condensation problems is in a small Thornes observation hive which had one brood frame and two super frames. 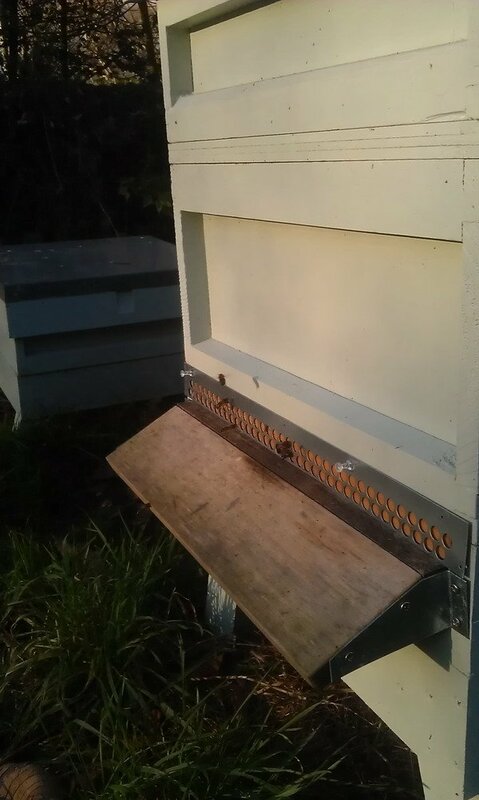 I have now taken that out of the housing it was in and put a swarm in the much bigger space that surrounded it. This has a top exit and holes at each side at the bottom covered with mesh. Again no problems seen. I think what I was seeing was them concentrating nectar by fanning down the comb face and the humid air hitting the cold mesh floor, condensing and it dripping onto the slide. There is a big flowering mahonia (barberry) bush the other side of the church which they might have been foraging from. Or maybe it was the fondant being stored. Either way, don't panic, they'll handle it, is the message.